I liked the way they play it and the words they use in all 3 languages. I minimized the "video" part of the clip simply because it's just art flashing, no real relevance to the group playing. As a kid, when I'd hear people sing variations of this song, I would think that they were poking fun at Lubavitch, since they were the ones who sang this song. Others, like Vizhnitz, may still sing it on Purim till today. ahhhh. 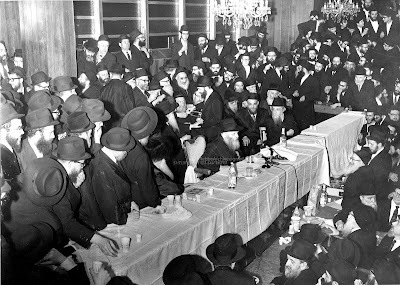 A day in the life of the Rebbe of the Dushinski Chassidim. It's pictures like these that makes the commoner quite jealous of the elites. He's - the commoner, that is - never visited a vineyard/wine making place, and nor does he care for dry red wine, unless he's French or I-talian. Not since the days of Marienbad, Krenice et. al. when all the gutte yidden would walk around with glasses of mineral water with those big straw "thingies" protruding has there been such a heartwarming sight. This being shortly after the YomimTeyvim, it seems like the DR is up North in Israel, enjoying his much-needed time off, after a long and arduous month of Tishrei. I can see it now; lots of you jumping out of your seats, slamming your clenched fists on your computer desks, demanding to know why this two-bit Chabadskeh is making fun of other Rebbes when his Rebbe once visited an art exhibit next door to 770, and the Frierdike Rebbe would vacation all the time as well! Well, you could not be more hopelessly wrong! I have nothing but the greatest respect for him. 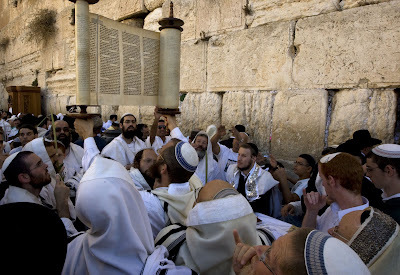 I think any Rebbe or Rov or Rosh Yeshivah who has no problem with being photographed on such an excursion is a rare find and should be put on a pedestal for all to see and emulate. No, my friends, we didn't forget Reb Yisrolik Shemtov, the pride and joy of Crown Heights. Yisroel has been making top quality kapotes for some years now, at the Crossroads of the world, Kingston Avenue and Empire Boulevard in beautiful Brooklyn, New York. And a visit to his shop is not just a SHOPPING experience, it's a good word, a helping hand, and maybe even a solution to one of life's difficulties. 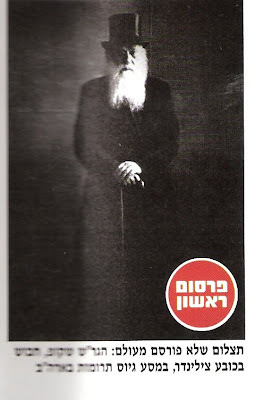 Even his ads in the Tzachlist, and his business card (!) list his other "professions." Which is why to box him in as just another option where to buy your long black coat is unfair to all of us. Yisroel ben Reb Bentzion is deserving of his own post, a thread that discusses his accomplishments over the years, despite the fact that I have yet to buy a kapote there. It's not for nothing that he's beloved by all, unless they happen to be power-hungry fools who want him and others like him out of the way. Magazines these days like round numbers. 20.30.40.50.60.75.100. Even 70 years. 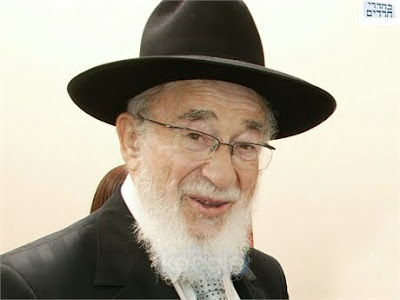 This week it was Reb Shimon Shkop's turn. Soon it'll be Reb Baruch Ber, and then, in the summer it'll be Reb Chaim Ozer. All 70 years since their passing in 5700. The problem is that since there are books and books written about these people you need a twist, something new, some angle we never heard before. Or some new, never-before-seen pictures will do the trick as well. Mishpacha magazine (Hebrew) had some good ones this week, which we'll share with you today, as well as discuss them. If you'll allow me; I think the above picture gives us a short glimpse into the love that Reb Shimon had for his talmidim. 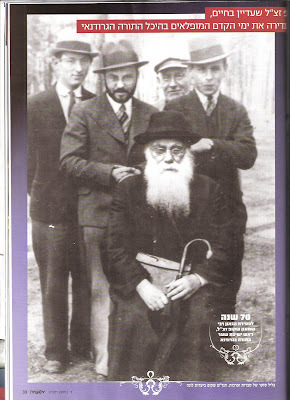 I doubt if some big Rosh Yeshivah in his 70s today would pose like that with his bachurim'lach. Then again; this should come as no surprise to us, since RSS took the wandershtekken in hant and traveled to America for a long time, just so his bachurim'lach can sit and learn BeMenuchas HaNefesh and not starve, KiPshuto. So what was the twist this year, you ask? Well; for one, this picture, the one with the Tzylinder. Yeah, they have a conversation with a talmid who's still alive and well, but the Tzylinder tells us a whole lot about the times and the person. It seems like some well-meaning yiddel told Reb Shimon "az in Amerikkkeh darf men geyn sheyn OhnGetohn, azey vi in Vilne. Mit aza shlappe vet men nit machen kayn gelt." Reb Shimon - who had the talmidim and the Yeshiva in mind - did what they told him to. You'd never see that today - and yes, times have changed, there's no need to dress up today when collecting money for Yeshivos, but the point stands. 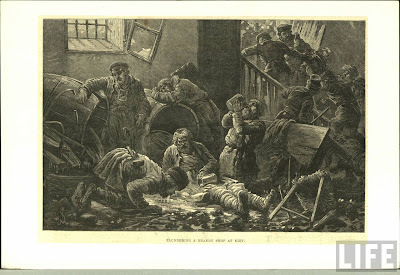 For some reason this picture is a "pirsum rishon;" others like it have been around for a very long time. 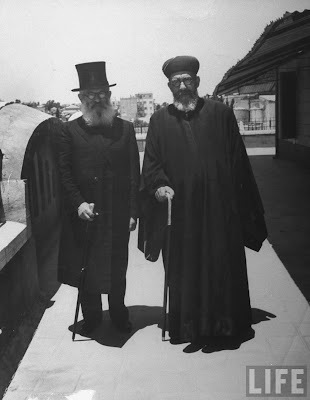 The Kovner Rov and Reb Moshe Mordche Epstein both come to mind wearing the top hats in America, despite not wearing it in Di Lita. 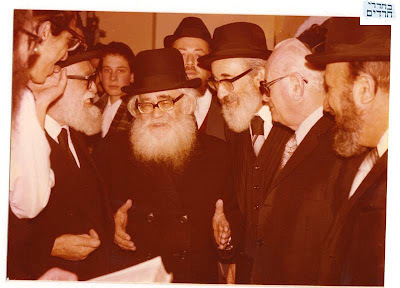 Yet Reb Shimon with the top hat never saw the light of day until this week. Which makes you wonder.... but it could just be that only this week did the owner of the picture decide to release it. Who knows? Trust nobody. לורנץ from bhol on Vimeo. 3) a man who's so, so proud of his book about the "Gedoylim"
---------- Then there was Hans. The bessere mentshen really went all out and got their kapotes there. Why? because that's where the Rebbe got it. The Yid would come to 770 every once in a while and take the measurements in GEH. Most people only knew he existed because of his relationship to the Rebbe, not because they ever saw the inside of his LES tailor's shop. We won't spend lots of time discussing him, simply because it's almost a Milsa DeLo ShChiCha. I'm not even sure if he's still alive. The point is as follows; I wanted to give the readers a peek into the Lubavitcher Kapote culture, which is why I went into the whole arichus haDevorim and explained what, where and how much. Truthfully, there never was much culture to it; it was very simple no matter where you got it, just like the hat was simple. Most Lubavitchers got the same hat in the same store for the same price, maybe a bit too much. Then "culture" started to make headway even in the sacred minhag of wearing long on Shabbos, and we have yet to see the end of it. Crown Heights has come a long way since the 70's. For a few decades the only thing you could buy there was groceries, and even that wasn't cheap. If you wanted cheap groceries you went to Boro Park. Even if there was a store that sold women's or baby clothes you didn't shop there because you didn't want the whole shchuneh to know how much you spent on your dress. That may sound like an exaggeration, but it really isn't - or wasn't. You may have bought children's shoes there, but only for a while, while the family was still small. After that you went to BP to wait in line at Schwartz's or Tescher's, just like the rest of klal yisroel... (who says Lubavitchers are different? )I'd say about 95% of men went to Bencraft in BP or Williamsburg to get their hats, either because they wanted their Borsaloinos, or because old man Gelerenter just didn't fulfill their hat needs. The same thing went for kapotes, surduten and sirtuken; someone discovered Hartstein in Boro Park making good kapotes and the word got out. And it was a good thing that Meester Hartshtayn had that niche, since most of the Chassidishe Oylem went to the newer guys on the block; G&G, Roth, Broadway, Royal, Reinhold and Kesser. דור הולך ודור בא- a new generation came along and decided that shlepping to BP and the city is no tachlis, so they decided to go at it by themselves. New stores started to sprout out all over the neighborhood, one more chic and hip than the other - which is not always a good thing for a Yiddishe schuneh.... These stores enabled a new generation - many of whom didn't have the hangups and inhibitions of their predecessors - to raise the standard of goods and services available, and shop locally. One of these new stores was a tailor - there's more than one by now - who makes kapotes for young men about to be married. As is often the case some of the entrepreneurs came with new ideas, and the ideas were not necessarily to increase the width of the aisles in the local groceries... Some of these entrepreneurs don't seem to get the idea that some thing just need to be left alone. To them everything is a joke, a challenge, or the basis for a new twist. Some of these people are so adverse to simple clothes that to them the idea of wearing a simple kapote is overwhelming, so they look for ways to get around it, like an adolescent girl who's forced to wear the school uniform, but makes up for it in areas not mandated by the school. You might say that for me continuing to shop at Mr. Hartstein's store is carrying on the tradition. The new-age kapotes, even the ones that are silk, all have that wool look to them. I guess the idea is not to look too chenyokish, even if you are wearing long. Sort of like not wearing it too long, just around the knees, or maybe a bit above... Another way of showing the world you're no "square" is by getting an orange or red lining in yours. That way you show your friends that you're "cool" and "hip," even if you cannot make a simple Brochoh on the Torah without swallowing half of the words... This many sound like a stretch to some of you hipsters, but you have a big hand in destroying what the Rebbe built with your kapote shenanigans. This may sound like a HUNGARIAN bringing his naarishe shtik to your enlightened world, but then again, it's not like you have anything intelligent that would disprove my theory. 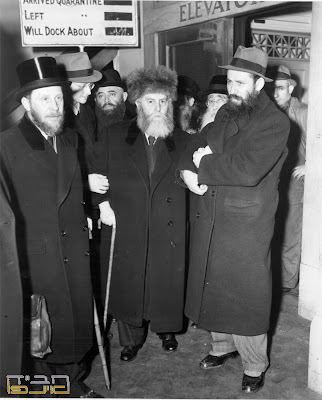 The same goes for those new-fangled hats that the young whipper snappers wear; that too is a breakdown of pretty loose rules of dress that Lubavitch has instituted, and that too should not be accepted just because Bencraft and Primo decided it's time to shake things up a bit. I think it was blogger SDR that sent in this link, and what a sweet video it is. I had heard that RMSS was a gutte baal menagen oyfen Litvishe shteiger, but never did I hear him sing. (The caption is obviously a mistake, it's not Reb Avrohom Shapira of Mercaz HaRav.) This is a nigun composed by the great Rab Borich Ber, zatzal, prized and beloved talmid of Rab Chaim, zt"l, of Brisk. The niggun featured here is actually on an album made by the Gateshead Boys Choir, where they sing it with shinuyim kalim, as Mendy Lipskier of Heichel Neginah would so aptly put it. What can I say? Imagine if he volt zich genummen tzu chassidishe neginah, how sweet that would be! We could say the same thing about Limud HaChassidus as well. 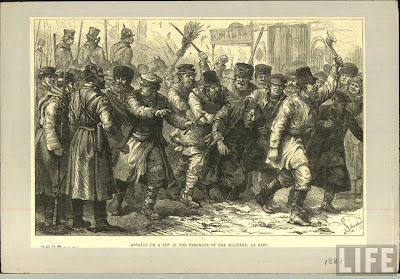 The niggun is only made more sweet by the "ay" in BeAyr Ponecho and Teyras Chayim, and the rolling rrrrrreishes accompanied by a French cuffed hand swinging to and fro. Ah! vi zis un vi gut iz tzu zein a Rosheshiveh! Often times in Lubavitch the weirdest stares and looks are reserved for those who don't toe the line. Meaning these people look too frum. Guys that go far out the other way blend in OK, even if they disrespect Lubavitch protocol and guidelines. I never understood that. And nobody ever had a good explanation for it. Why is Moridin BaKodesh OK, but not Maalin?! The same goes if you leave the brim of your hat up, because you had put it down on a chair or had it up because of the rain, every person who sees you will tell to put your brim down. Walk in without a shirt or wearing shorts and no socks and nobody sees it. And if you do "notice" it, or Chas VeSholem tell the man about it, you're some species of evil-eyed bores. I guess it's some kind of Hiskashrus thing... 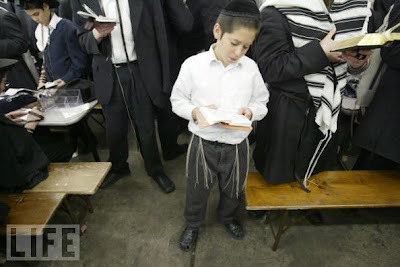 But to their credit, where green and tan and sky blue suits were once the norm with some of the old timers or American-born, now Shabbos is Kulo Kodesh, all young men wear Kapotes, almost as religiously as the Hungarians wear shtreimlach, beard or no beard. At least that's what thought. Until recently you had very little choice. Most yungeleit went to Hartstein in Boro Park to purchase their shabbos'dige beged. You might have gotten the wool, a simple "Rosh Yeshiva" type frock, - with either covered or uncovered buttons - which may have come with a pair of pants; the $200 polyester that you told yourself was zeyden because maybe Mr. H told you or you convinced yourself, or maybe the real deal, if you had the dough. The "real deal" ( a real silk kapote) comes in two varieties and the prices vary as well. The 400 dollar variety was a very thin silk that looked like a wrung out shmatte after wearing it just once. I think it's the fact that it lacks a stiff lining that allows it to get so creased so quickly. You bought it only if you were limited by budget constraints, or if you knew not better than to buy the cheap one. Those that were always makpid to buy the pure silk often went with this one, for obvious reasons - money. The problem is you always were on the verge of the next one, and the savings you thought you had quickly didn't remain so, since you had to replace the beged more than twice as often as the more expensive alternative. Then there's the more expensive kapote, the one that fetches $650.00, which often goes to Chassanim only. A chosson usually gets the advice from his friends and convinces his parents to break the banks and the GeMaCHim and buy it for him. (After all, he doesn't get a shtreimel, so let him enjoy one luxury on his wedding day, no? If taken care of the chosson special can last you 4-5 years, which means that you wear for the same time that you would wear 2-3 suits, definitely making it worth the added expense. And when you factor in the fact that you wear this baby all the time, no tish bekitshes in Chabad, remember? (at least not away from the tish) means you wear it Purim, Chol HaMoed, at Mincha Shabbos, and so on. The "Peylishe" get away with wearing tish bekitshes half the time, while wearing shiny polyester the rest of the time, while us, we need to wear that heavy beged all the time...) Which is why I'm on my third "expensive" Kapote as we speak. 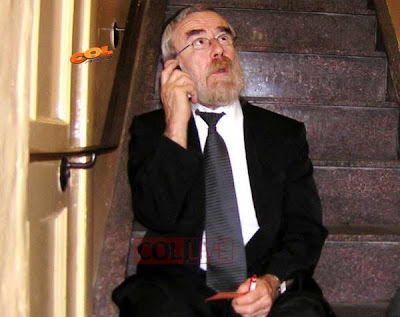 Mr. Hartstein - tzu lange, gezunte yohren - is a nachas to work with, especially since we speak the same language. On the advice of a good friend I broke the bank and paid the $5.51 including shipping to buy this book from Amazon. The friend had told that it was good but I NEVER expected it to be a can't-put-down book. And books like that can be difficult and complicating when the kids need to be put to bed, or the time for Maariv comes around... What can I say? there's something about reading first-hand experiences from years past that makes it irresistible, despite the fact that my ancestors may not have been from those parts. Reading about customs and laws that you recognize and practice, especially when there are these very boorish mistakes, makes it especially delightful. She knows about Tikkun Leil Shavuos but thinks there are only three Aroves in the Hoshaynes. She also thinks that on Hoshanoh Rabboh the men read Mishneh.... The editors/translators (from the original German) sometimes catch the mistakes (like the Hoshanoh Rabboh Mishneh mistake) and sometimes miss it (like the 3 Aroves in the Hoshanes mistake.) I haven't gotten very far in the book, but there's lots to talk about even a quarter of the way through. Pessel (Pauline later) Epstein was born and raised in Brisk in the earlier half of the 19th Century. She was a close relation to the Torah Temimah, and the Chossid Reb Eizel (Epstein) Homlier was also in her family tree. Her father was a very wealthy man, I'd say even by today's standards, a man who's home was frequented by aristocracy constantly, yet who lead a very Torah'dige life despite that. He even was a mechaber seforim! According to Pessel he would rise at 4am, learn Gemoroh until 7, go to shul, come back after 10, conduct business for a few hours, and then was back to the Gemoro again. Her mother, despite living like a queen with the finest clothes, servants and maids galore was a frumme Yiddene to the extreme, no different than the simple folk of her day, even with all the contacts in the aristocracy they had, all the money and comforts not withstanding. She worked very hard, leading the kitchen staff, but doing her share, watching everything going on in the house like a hawk. Her (Pessel's) sisters married the best YESHIVEH bochurim and the young men continued to learn while getting kest from their shver. But when the mother suspected them of being influenced by HASKOLOH she took action and berated them, despite it not doing much good. The memoirs were written when she was at the end of her life, having lead a very "enlightened life." Yet she writes so respectfully and so longingly, as if she was doing Tshuveh for not behaving like she was raised. And it's not for the riches that she longs, but rather for the practice, the laws, the preparation, the joy and the awe. She misses the cleaning and scrubbing for Pesach, the Brokhes Erev Yom Kippur and the Kalte Kapores she ate on YK as a child; the Tashlich and the sedorim, the drunk men on Simkhas TEYREH, and even her mother reading Kinnes for them on Tisha B'Av, when she cried over the Churban Beis Hamikdosh like it was just happening, and for the Tsores the Jews have endured over the centuries. What I found amusing/strange was the fact that she went to Kheyder, with her older sister, and had a melamed, Reb Layzer, teach her from morning till night. Only during Tishrei and Nissan did she have off. It seems like it was normal practice in those areas; she makes no mention of her and her sister being the only girls, which would leave me to believe that there were others too. All in all she makes a very good case that Jews could be G-d fearing and be wealthy at the same time, despite the fact that she had three children convert r"l to Christianity just to be able to "fit in" to Russian society, where a Jew couldn't get a job. I realize that sounds weird, but hear me out. Pessel speaks at length about the LILIENTHAL reforms of the 1840s, when he traveled across the Russian Empire inspecting the learning conditions. She also speaks of the sweeping haskoloh winds that engulfed her family, despite the fact that they were wealthy and didn't "need" haskoloh and knowledge to get out of the scum and filth of the ghetto like most of the others. What I guess I'm saying is that people with money and connections could be tzu Gutt un tzu leit because they have the means to be with "LEIT." Often times it's the Orimman that has no choice - eyb m'ken azei zoggen - but to leave. Take that for what it's worth, it could my avocado lunch talking... You could do worse than buy this book, is what I'm saying. You'll laugh and you'll cry with real people who had real issues, many of which we can identify with, albeit more advanced ones. Hello there. My name is Hirshel Tzig. I have a blog here in the 'sphere that I sometimes update. I hope y'all will stop by here every once in a while, and tell all your friends about the blog as well. I haven't read the Mishpacha magazine article where R' Yehuda Krinsky tells all to Yitzchok Frankfurter, so I have no opinion as of now. What I did notice somewhere - I think it was on one of the Chabad websites - was the article somewhere about the Ribnitzer Rebbe, zt"l, where his Rebbetzin was asked all kinds of questions about her late, great husband. Somewhere in the article she says that her husband held the Satmarer Shittah. Closed quote. Then she says that he went to the Kosel or permitted others to go, I forget which it was. Even when she traveled to the Holy Land she asked him if she could go to the Wall, and he said it was OK, as long as she didn't go very close to the stones. And why? because of the Kedusha! Not because the Zionists defiled it, or something. So tell me; what kind of Satmarer shittah is that?! Just say it like it is; that he was shlepped to Satmar, because his handlers thought it better for business! There was this one guy - a protege' of mine, he likes to call himself - where he blasts Mishpacha for doing the interview/article in the first place. A bad business decision he calls it, since the shtarke yeshivishe oylem is gonna cancel their subscriptions en masse. "They don't want their children to emulate that man," he tells me. There are many aspects to such an opinion. First, I find the attitude so high and mighty that yesterday's supper rises to your throat. Who do these nobodies of questionable yichus think they are?! Other than the Rosh Yeshive types most of these Yankee doodle dandies grew up here in America with little direction, and under the auspices of Horowitz MARGARETEN and the Morgen Journal. Where does this phony Kano'us come from?! We discussed this before, I don't want to repeat the same diatribe again. Nu, shoin, vos darf men redden.... VeDal. What gets me is him saying that they crossed the line not when writing about MO Rabbis, movies and when they write "heypech Daastoyreh," but when they write respectfully about the Rebbe.... It would be funny were it not so sad. Which brings me to another such story; one that shook me to the core, despite the fact that these things shouldn't surprise me at this point anymore. In our Ir haTorah VeHaChesed (Greater) Monsey there lives a certain high profile doctor. It seems like over YomTov some Lubavitcher yungerman crossed his back yard in order to hurry to shul. We can argue the point of whether or not he was allowed to do what he did, but he definitely did no damage and doesn't do it very often. The doctor's wife - a fine Bas Yishmoelroel saw him and yelled something to the effect of "you Lubavitcher pigs are bringing down the property values in Concord..." (Concord area in Monsey) The man was not happy and came to shul that evening to insruct the ROV in our shul to make sure to lecture his kelblech congregants not to G-d forbid cross this man's backyard. This was not enough for the doctor and his friend who tagged along. He came back the next day again, before Maariv Motzoei Yom Tov, and waited for the Rov to finish the shiur before Maariv before confronting him again and making sure that he did his duty. Believe me, I had no idea this was happening until after the fact, because if I did there would be no return visit from this mechutzef/Anti-Semite. A search of his name told me that he's the head of a department at a prestigious hospital in New York City. Which would make you think that he overcame his MESIVTA-level hate of LUBAVITCH, but I guess old habits die hard, even for doctors... 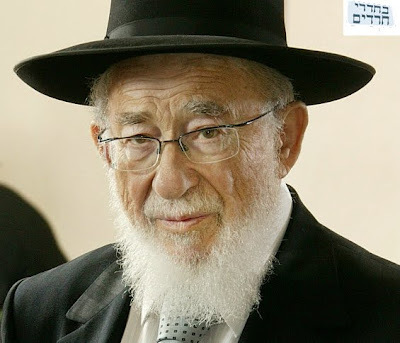 I would imagine organizations honor this man, and meshulochim may even get a nice check from this man if his machshefah wife isn't home to shoo them away. But even all the years spent in college, Med School and at his current practice, where he must have come across situations that he had to control himself, and I'm sure he's had some Lubavitcher patients pass through his office, none of that ever made that deep-seated hatred go away. Which goes to show you that hatred of LUBAVITCH - and maybe it would happen to other groups as well if a beshtreimeled yid used his lawn to cut a path across his lawn - doesn't go away no matter how hard you may try. I would like to pick this guy's brain and get to the bottom of it. Maybe he had a Lubavitcher friend who took his lunch money, or a patient who never paid his bill, or a Lubavitcher once cut him off on the Palisades.